After reading the previous chapter, you might well be asking: Aren't some companies successful despite their reliance on the opinions of their salespeople? The answer, of course, is yes. We have learned that using the words always and never in the context of selling techniques is (usually) a bad idea. We will extol the virtues of what we label Sales-Primed Communications. Some companies however succeeded long ago before without the application of methodology described in this resource. We think there are at least two explanations. The first is that a small number—roughly 10 percent of all salespeople—use a customer-focused approach intuitively. 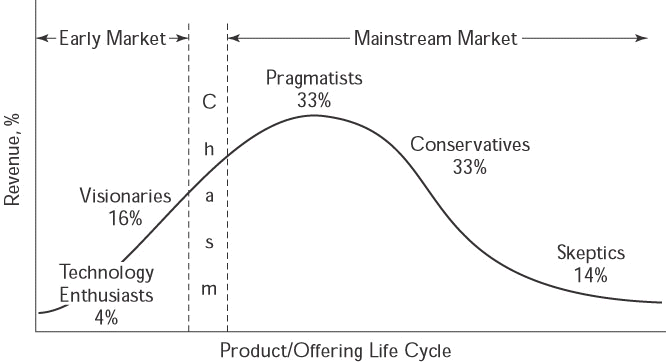 The second is that there are certain market conditions that make success without Sales-Primed Communications possible. This chapter describes those conditions—and also explains why it is important for almost all companies to migrate toward supporting their salespeople in positioning their offerings. Looks like a good list, right? But look again: With the exception of the last item, all of these factors are fleeting. The first condition is a good illustration: What happens when the supply of early-market buyers is exhausted? Because of the opinions problem described in the previous chapter, companies may be ill prepared to sell their offerings to mainstream-market buyers, who over the long run buy the lion's share of an offering and ultimately determine if revenue objectives will be met. Geoffrey Moore has authored several books describing stages of market acceptance of offerings, and especially of new technologies. He offers an approach to changing Marketing's message as offerings mature. See Figure 3-1. The premise for much of Moore's work is that there are different types of likely buyers at different phases of an offering's life cycle. This may sound obvious and easy to act on, but it isn't. Even if Marketing recognizes the need to change its approach and is capable of doing so—two big ifs—how does it convey the message to the field sales reps? We'd like to provide our views of the life cycle of an offering from a sales perspective. The early-market Innovators and Early Adopters are composed of technically savvy people who are willing and able to buy from companies with a limited track record and/or offerings that few organizations have implemented. In terms of technology, early-market buyers have the ability to visualize usages and view new offerings as potential competitive advantages, if they can implement them early enough in the offering's life cycle. Why is this interesting to us? Because early-market buyers excel in determining applications for technologies that can give them a return on their investment in those technologies. In other words, they're doing what we contend traditional salespeople don't do. They focus on uses rather than features, and this is a talent that is in short supply in most selling organizations. Early-market buyers have defined and will continue to define start-up organizations' niches. A few years ago, we were hired as consultants to a venture capital (VC) firm that had identified specific market segments for potential investments. One of their criteria was that companies had to have shipped to at least two customers; another was that the management team (and especially the CEO) had to have a strong track record. The VC team felt comfortable in assessing these areas, but also felt that there was a missing piece in most business plans. That missing piece was a clear statement of how the potential portfolio company was going to achieve its top-line revenue projections. Why? In our experience, people with the ability to develop new technologies and build companies around those technologies are truly gifted individuals—but those gifts tend to show up in specific areas. The habits that make them great innovators are not necessarily those that will serve them well in the marketplace. Many are so enamored of their offering—their "child"—that they have what we call the Field of Dreams mindset: "If we build it, they will come." When challenged to talk about vertical industries, applications, and potential business uses—as opposed to technical artistry—some of these brilliant innovators get defensive, or even feel insulted. Converting their creation into a business offering somehow seems beneath them. In many of the business plans we reviewed at the request of the VC team, little thought had been given to which industries could use this new technology, which titles would be involved in the decision to buy or not buy, how the offering would be used to achieve goals or solve problems, what business objectives could be achieved through its use—and so on, and so on. In other words, very little thought had been given to how the offering was actually going to be sold. Typically, the revenue plans assumed the acquisition of a few customers in the first year. Future revenue projections consisted of pie charts showing growth in that market segment and assumed that the company would attain an increasing percentage of that growth, and the associated revenue, over the next several years. But the mechanics of getting there, from a sales standpoint, were sorely lacking. Companies going down this track tend to create technologies in search of markets. And unfortunately, brilliance alone is not enough. Xerox provides a powerful and sad example of a truly brilliant research-and-development operation that failed to find the applications for many of its creations. The mouse, icons, and desktop that are now used on every PC were all developed by Xerox. And yet Xerox reaped very few financial rewards for all its innovations. If you build it, they may not come to you. They may go to the company that figures out how to show buyers how to use it and sells based on that application. Let's look a little more closely at these early-market buyers, who have the rare ability to (1) grasp new capabilities and (2) visualize how those capabilities can be used for business applications at an acceptable cost. How do they work their magic? In most cases, it's not easy. Within larger companies, early-market visionaries face a series of challenges, even after they have identified a new technology that they feel should be implemented. If they are unable to allocate unbudgeted funds, for example, they have the ability to champion a new approach and sell one or more people within their organization on the potential benefits of this new offering. To succeed at this, of course, they have to know the right person to approach and the right way to make the case. Most decision makers up the ladder are likely to be risk-averse, and therefore ask the question: "Why don't we wait until some other companies in our industry validate the approach?" Our experience suggests, however, that early-market visionaries control (or can get access to) adequate funds. As a result, most early purchases are made impulsively, without extensive debate. In other words, gut instincts play a much larger role than formal cost-benefit analyses. Early-market buyers are willing to endure the inconveniences and disruptions that almost always come along with being first-generation customers. Potential problem areas include poor product reliability; inadequate training, documentation, and support staff; missing functionalities; and so on. Early-market buyers often participate in identifying these kinds of problems, and in making suggestions about possible improvements. In fact, these customers sometimes use their position to drive product development in directions that will be most advantageous to their own agenda. In such cases, they're unlikely to be worrying about what the requirements of mainstream-market buyers may be. Assuming you want early-market buyers—and in most cases, you should—how do you find them? It's not easy. The best approach we've seen is to try to get exposure for new offerings by asking Marketing to create "buzz," and then to wait for the early-market buyers to find you. If your product is good and the buzz is adequate, they will find you. And when they do, you'll be in good shape, because early-market buyers buy. They don't need to be sold. Beyond that, early-market buyers are often found at small to mid-size companies (or divisions of large companies) that (1) have minimal red tape and (2) aren't burdened by the need to get a consensus to make a somewhat adventurous buying decision. Like venture capitalists, these buyers understand and accept that some decisions will not achieve the desired results. Let's say that they make ten buying decisions. If two exceed expectations and six are moderately successful, they can easily tolerate two mistakes. They can be confident that the advantages accruing from those two good decisions will outweigh the write-offs. When implementing a new offering, early-market buyers generally have the expertise to integrate the new technology into their current environment. Let's take a humble example on the retail level. An early- market audiophile assembling a sound system would research all options, focusing on recently announced offerings and also considering lesser-known companies. The best individual components would be chosen, and the task of integrating them would begin. The early-market audiophile would buy (or make) the necessary interface cables, and might even make a custom cabinet to house the system.